Tasting Notes: A clear cherry red in the glass. On the nose, aromas of red fruits and cassis with earthy notes. On the palate, light and juicy with great acidity with plenty of sweet red fruit flavours. The finish is fresh and medium in length. 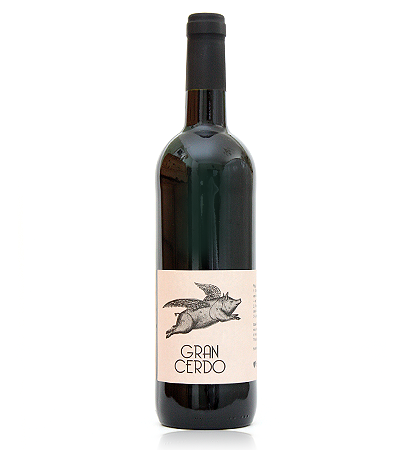 Gran Cerdo is a great wine dedicated to the bank executives that denied loans to us on the basis that wine is not a seizable asset. One day, those greasy and corporate suits will find that the best things in life cannot be impounded. Thanks to our friends help, we were finally able to bottle this wine. Now you can enjoy it with pastas or ham. Serving Suggestion: Great with roasted chicken pieces with pears and raisins, slow cooked roast shoulder of lamb with thyme and juniper berries or a salad of Canteloupe melon, chorizo and artichoke.